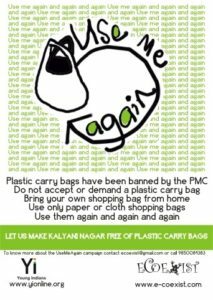 eCoexist initiated work on cloth bags through a campaign called UseMeAgain in Pune. This campaign aimed to encourage people to switch to the use of cloth bags from plastic, and to buy or make bags that they could use again and again, hence the name. This approach came from the understanding that unless the Use and Throw attitude was replaced by a Reuse attitude, we would continue to generate waste of all kinds. In this campaign we involved residents of Kalyani nagar, students from the two schools in this neighbourhood, shopkeepers and vegetable vendors. We went from house to house and shop to shop speaking to people about the need to replace plastic bags with cloth bags and to help them make a beginning offered free cloth and newspaper bags. Beyond raising awareness, we also realised that unless there is a steady supply of natural alternatives materials such as plastic cannot be replaced. This was the beginning of our brand of cloth bags which we aptly named, the UseMeAgain bags. The alternatives to plastic bags as a means of transporting goods are varied. It depends on what needs to be carried, how far it needs to go and who is carrying it. The Virtual Internship programme run by eCoexist mentors students all over the world to study the plastic pollution issue in their own countries. The articles below are the outputs of their work. This programme is run in collaboration with the University of Birmingham, Swinburne University and Franklin University. Bag Wars: What Do British Consumers Look For In A Shopping Bag?